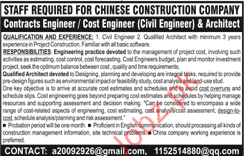 A well reputed Chinese Construction Company is looking for Contract Engineers, Cost Engineers, Civil Engineers, Architect Engineers, Architectures in Islamabad. You can apply online at vacancy after registering at http://www.jobz.pk site. I have three Diploma of civil Engineering and have above 15 years experience in Road , Building and Canal construction as site Engineer and Site Supervisor. i really love to be as an architect to participate an achieved the company goals and objectives.